(NASHVILLE, Tenn.)—YWCA Nashville & Middle Tennessee hosted the annual Stand Against Racism April 27 and 28 with a community rally in Public Square Park and a Youth-Led Forum at the Downtown Nashville Public Library. The Stand Against Racism is a signature campaign of YWCA USA to build community among those who work for racial justice and to raise awareness about the negative impact of institutional and structural racism. More than 400 Stand Against Racism events were held across the country between April 27 and 29. Mayor David Briley welcomed the crowd to the annual event that drew more than 200 people. Civil Rights Activist and retired educator Gloria McKissack shared how young people in the 1960’s sat down so we could all stand today. McKissack was part of the student movement from Tennessee A & I (now Tennessee State University) and Fisk University that integrated the lunch counters and other businesses across Nashville. Legal Aid Executive Director and YWCA Board Member DarKenya Waller urged the attendees to work together. “If Black or Brown people could have solved this problem by ourselves, we would have done so already,” she said. The Friday rally included a look to the future, with remarks from Antioch High School senior and Girls Inc. club member Carol Salas. Singer Dara Tucker entertained the crowd and Southern Word Poet and Hume-Fogg High School student Bella Dotson shared a powerful spoken word piece. Two dozen community partners took part in an advocacy fair. The first-ever, intergenerational Youth-Led Forum took place at the Downtown Nashville Public Library the following day. Planned by the YWCA’s Youth Empowerment Committee, the event kicked off with the Tennessee Titans’ Caravan. A panel discussion with players Jayon Brown, Corey Davis, and retired Titan Chris Hope, focused on character and working together to eliminate racism. 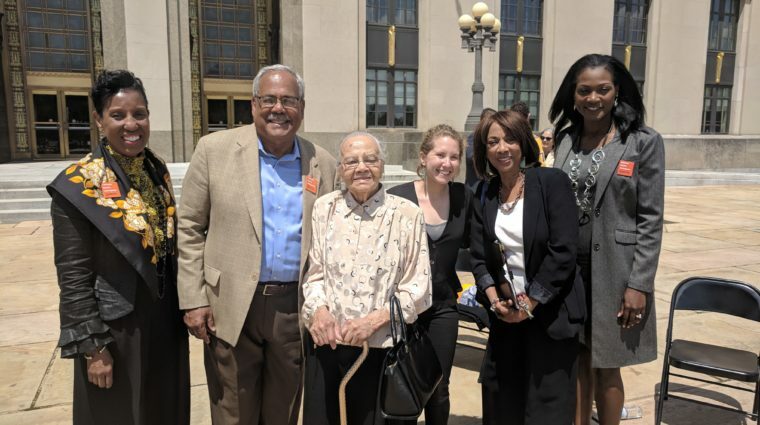 Nashville 16 members Ethel Carr Crowder and Errol Groves joined the youth forum to share their experiences integrating Nashville Public Schools in 1957. Activist and recent Fisk University graduate Justin Jones inspired the crowd with his words and a symbolic gift of stones from the Edmund Pettus Bridge in Selma. He had just returned to Nashville from the opening of the National Memorial for Peace and Justice in Alabama. The Tennessee Titans were the presenting sponsor of the two-day event. The Metro Human Relations Commission and Tennessee Human Rights Commission were returning sponsors. View photos here. About YWCA Nashville & Middle Tennessee. For 120 years, YWCA Nashville & Middle Tennessee has helped women, girls and families in Nashville and Middle Tennessee build safer, more self-sufficient lives. YWCA is dedicated to eliminating racism, empowering women and promoting peace, justice, freedom and dignity for all. Programs include Domestic Violence Services, Girls Inc., AMEND Together, j k livin, Dress for Success and the Family Literacy Center. For more information, visit www.ywcanashville.com, follow us on twitter YWCANashville, Instagram @YWCANashville and find us on Facebook facebook.com/YWCANashville.